Feeling overwhelmed with twins? Surviving twins is hard, but not impossible! Discover the secrets to raising twin babies without losing your mind. Adjusting to motherhood had been hard for me as a first-time mom. So much so that it had taken a while—two and a half years—before I was open to adding another child to the mix. I figured my son was “easier” now, so even with a newborn, I felt better able to manage. I’d be a second-time mom, after all. Experienced. So when I learned that my second pregnancy was not in fact one, but two babies, I just about had a meltdown. I couldn’t wrap my head around surviving twins, especially after the sleep deprivation I had gone through with my eldest. I thought I’d have this pregnancy thing down pat, but instead I felt like a new mom all over again—this time, a new mom raising twin babies. Still… I learned that surviving twins is possible, without going completely crazy. It actually helped that this was my second time around, as I was mentally prepared for what to expect. And more importantly, I knew that the newborn stage would be temporary. I also did a ton of research on simple hacks to get me through it. 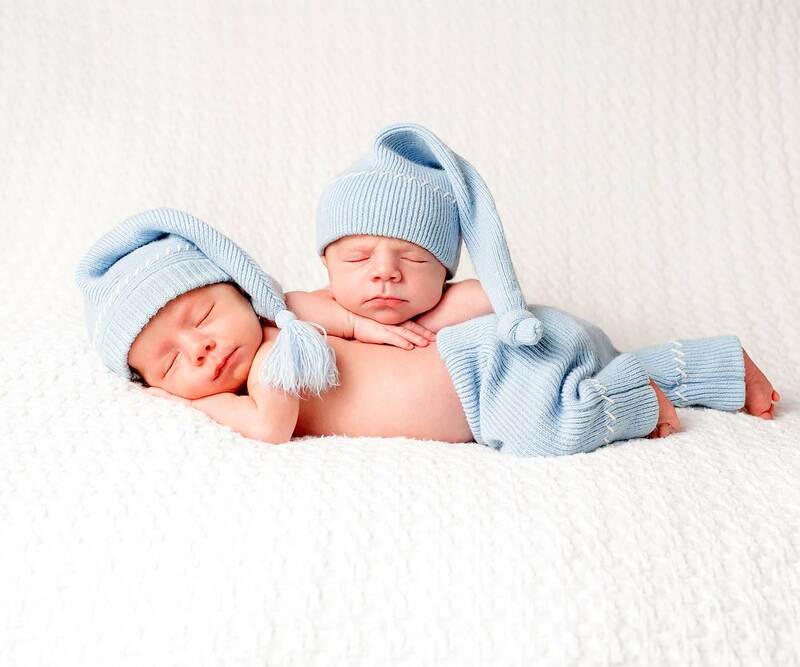 These were the tips that became a must when caring for twins. Thanks to both being prepared for twins and knowing this wouldn’t last forever, surviving twins was much easier than I anticipated. The good news is… you can apply these tips on how to raise twins. No doubt you’ll still be exhausted—there’s no getting around avoiding the challenges that come with being a twin mom. But you’ll get through this stage more intact, better rested, and even happier than you thought. You might have heard the advice to put your twins “on the same schedule.” I’ve said the same advice but have now changed it to “synchronize your twins.” When you hear “put your twins on the same schedule,” it’s easy to assume you’re supposed to do things by the clock or at a certain time. The newborn stage isn’t conducive for putting your twins on a clock-based schedule. In some cases you should—for instance, you can give your twins a bath at 6:30pm every night. But for most activities like eating and sleeping, it’s better to wait for their cues or follow a flow instead. So, what do synchronized twins look like? Do the same things for both twins. If one twin wakes up to eat, feed both of them. If it’s time to wake one up, wake the other. You’ll have wiggle room, maybe 15 minutes here or half an hour there, but for the most part, you’ll want to do the same activities for both twins. Get them ready for bath and bed at the same time, and feed them together as well. This saves you time from keeping track of who did what last time. You can also batch process many of your activities, such as feeding or taking a nap yourself while they’re asleep. If you keep each baby on his own schedule, you’ll have no time to rest yourself. Get more tips about breastfeeding twins. Many people will want to visit you and meet the babies, especially on weekends. But see if you can arrange for a long-term stay, such as your parents. As useful as it is to have people bring food and help with household chores, nothing beats someone who can stay with you for an extended time. After my twins were born, my mom stayed with us for the first three weeks. During that time, she knew nearly everything about caring for the twins, from which twin liked the pacifier to which one tended to sleep longer. Not only did she understand the twins and their routines, but she also knew how we ran our household, like which cupboards the clean dishes go back into and what my toddler liked to eat for breakfast. Having her sleep over gave us an extra set of arms for the middle of the night, too. She was always willing to hold a fussy baby just so my husband and I can get a few moments of sleep. With long-term help, you don’t have to explain over and over, like you do with visitors, how to feed the baby or change the diaper. You’re also less likely to feel compelled to entertain, since this person is so ingrained into your everyday routine. If you don’t have anyone to sleep over, consider hiring a night nurse, as many moms I know have done. This person can help during those sleep-deprived hours in the middle of the night to give you the sleep you need for the day. Before I had kids, a typical bedtime was around midnight, or 11pm if I slept “early.” With a newborn, bedtime moved up waaaay earlier. You’ll no longer be able to sleep for eight hours uninterrupted, so you’ll need to patch them together as much as you can. Since you’ll be up throughout the night, you’ll want to start having an early bedtime. Yes, it’ll be broken up into chunks, and you’re not getting that long stretch of deep sleep, but chunks of sleep are better than none. Aim for an 8pm bedtime, both for you and the twins. It’ll be dark and late enough at night for your twins to settle in. It’ll also be good for you to establish a routine—yes, even this early—to get them used to sleeping at night. Many parents feed their babies to fall asleep. After all, sucking is one of a baby’s most effective soothing activities. Nurse or bottle-feed your twins to sleep and they’ll likely conk out in minutes. The problem is your twins will rely on eating to fall asleep. Yes, you’ll find yourself in this situation many times where you’ll have to feed them to sleep, but try to use that as a last resort. Instead, encourage your twins to fall asleep on their own. One of the best ways to do this is to avoid feeding them to fall asleep. Feeding them after they wake up from naps also provides the calories to fuel them for their awake time. They’ll be more alert and ready to absorb their surroundings after a good meal. And feed your twins on demand. If there’s a chance they’re hungry, it’s best to feed them. Babies usually cry because they’re hungry and not much else. However annoying it is to feed them when it feels like you had just fed them, it’s best to do so. You’re not establishing bad habits or making your twins too attached, not at this point. Their growth and weight gain should be your main concern. I’d get annoyed when someone would suggest they were hungry, but in the end, I knew they were probably right. Feeding frequently also increases your milk supply. Your body won’t produce milk if it thinks there’s no need for it. The more you feed, the more milk you produce. Get more tips about increasing your milk supply. After you’ve fed your twins, it’s time for them to be awake. Here’s another good piece of advice I only learned way too late with my eldest: newborns should only be awake an hour to an hour and a half at most. After that, it’s time for another nap. I cringe writing that because it draws memories of me keeping my eldest awake at social functions. I didn’t think to put him down after a mere hour or an hour and a half, so he’d get overtired and have a harder time falling asleep for his next nap. Later, I learned my lesson when the twins came around. I watched the clock and, if an hour and a half had passed, I’d begin their nap time routine and put them to sleep. Any earlier and they were too wired to fall asleep, but any later and they felt overtired and cranky. As far as what to do during awake time, people make the best toys! Babies love looking at people’s faces and hearing your voice. Talk often to your newborns, while also keeping it a two-sided “conversation.” Don’t feel like you have to fill every minute with talking. Introduce your twins to new experiences, such as books, fun toys, and household items. They’re absorbing so much you don’t have to do much to impress them. Instead, use their awake time to bond, talk, sing, and otherwise spend time with your little ones. Many families rely on frozen meals to get through those early weeks at home. You can eat nutritious, home-cooked meals without spending too much time preparing them. They’re also an inexpensive alternative to ordering food. About two months before the twins arrive, prepare several meals for freezing. You can double the regular meals you’re currently cooking and freeze half of them (make sure the meals are freezable). Another way is to set aside a weekend or two to batch cook several meals you plan to freeze immediately. Store food in microwave- and freezer-safe containers or freezer bags. Leave some space in the container since frozen food expands. Allow food to cool completely before putting them in the freezer to prevent bacterial growth. Don’t re-freeze food once you’ve thawed it. High-moisture food like stews and soups freeze well, as do casseroles and pasta dishes. Label your frozen containers and bags so you don’t have to guess what’s in it. Write the meal, ingredients, and the date you froze it. Find out which household items you should stock up on before the twins arrive. Make sure you have everything you need long before you leave the house. 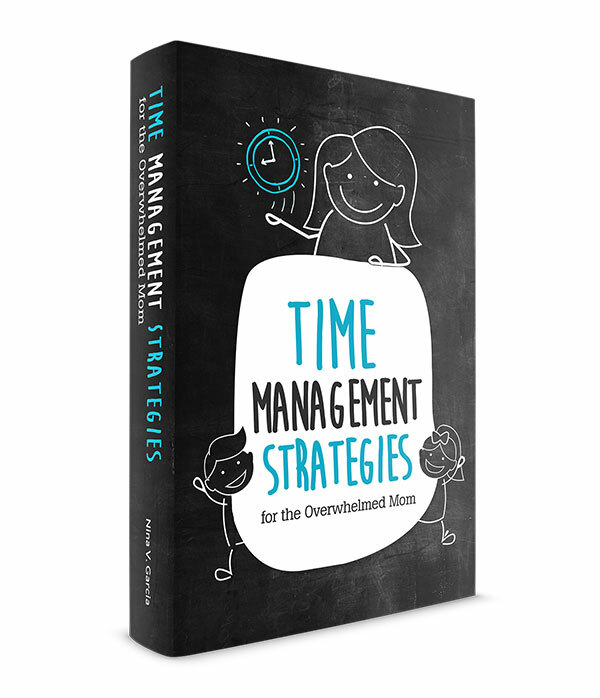 This will help you avoid scrambling or forgetting something in those last few minutes as you’re rushing out. The best way to do so? Pack your diaper bag after you get home from your previous outings. If you got home from an outing and used two diapers, pack two more when you get home. If you soiled the burp cloth, pack another one at the same time you throw the old one in the hamper. When the twins arrive, you might feel guilty for not spending “quality time” with them. One will be lying on her back while you’re calming the other… or you’ll be dedicating any spare moment you have not feeding or changing diapers to your older child. Never mind all the tasks piling up and competing for time with your twins. It’s no wonder twin moms doubt whether they’ll bond with their babies. When you have just one baby, it’s easy to spend all your time with him, but what happens when you have two? Will you be able to form bonds with each one as an individual? The good news is, yes! Even with caring for twins (on top of other children you may already have), you can still bond with each one. The key is to find one-on-one time with each of them. For instance, bond during daily tasks. When you’re doing baby tasks, your mind is in another world. 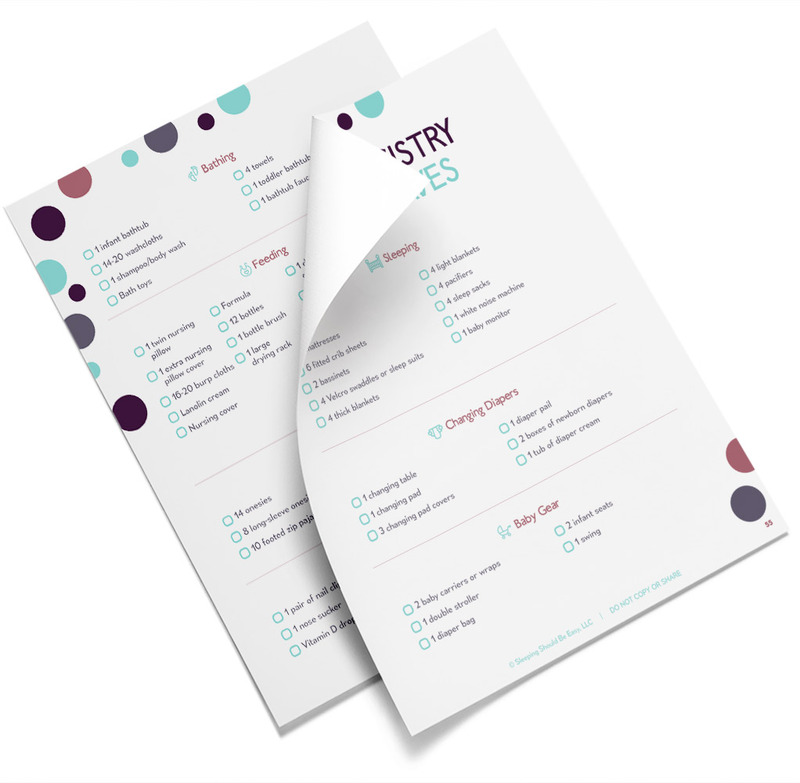 You’re thinking about what to do next or running through your mental to-do list yet again. Maybe you’re just too tired and are going through the motions. It feels like there’s never any moment when you’re not being pulled from one direction to the next. That’s why daily baby tasks are your secret strategies to spending time with your twins. Think about how often you’re with just one of your twins during the day, such as bathing or changing diapers. You’re already spending time alone with your twins. Use these moments to bond with them further. Rather than just going through the motions, talk with your baby. Describe the water pouring on his toes. Smile and kiss his forehead after strapping on a diaper. Yes, even with your other twin crying or waiting his turn to take a bath. Make the experience you already have with your current twin a positive one. Then, have another adult bottle-feed one of the twins. I’m all about tandem nursing, but in the beginning, you might feel more comfortable feeding one at a time. In the hospital, I tried tandem feeding but was still not confident about it. So for those first few days and even a few more at home, I fed them one at a time. I also formula-fed a few times, and when I would, my husband would feed one baby while I fed the other. If you pump, you also have the choice of having another adult offer a bottle of expressed milk. Use these moments to spend one-on-one time with each twin. Talk to them, snuggle, and focus 100% on them. It doesn’t have to be all the time (you’re allowed your Netflix binge on your phone! ), but these are the moments you can bond while they’re feeding. Twins by default don’t get the same attention that one baby would. They have to learn to wait or share their time. But this doesn’t mean your twins are stuck with little to no attention for the rest of their lives. Think about the first-born child compared to other children that follow her. She’ll get the most attention (first-time parents also tend to dote and worry more), but that doesn’t mean her parents love her siblings any less. The same is true with twins. It’ll be harder to balance both their needs than if you just had one baby, but you’ll find that quality trumps quantity. 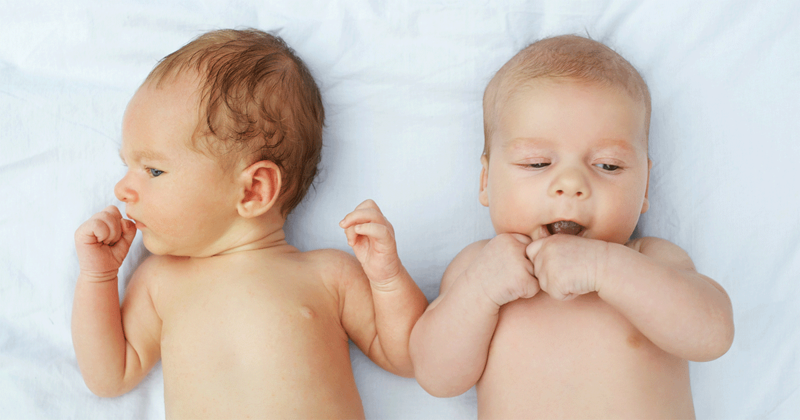 Don’t feel like you’re neglecting one baby or aren’t bonding with them because they’re twins. Surviving twins is hard, especially in the newborn stage. But life with newborn twins the next few months can be much easier when you have a few hacks in place. Synchronize your twins so they’re on the same schedule, and see if you can have someone stay for an extended time to help (especially at night!). Don’t keep your twins awake for too long, as this can tire them out. Then, aim for an early bedtime for the whole family so you can patch together enough sleep. Cook and freeze meals ahead of time so you’ll always have healthy home-cooked meals ready. Buy disposable dinnerware to avoid piles of dirty dishes. Save yourself time and hassle by packing your diaper bag after coming home. And if you’re worried about bonding with two babies, rest assured that you’ll have plenty of time to spend with each one, even if it’s during daily tasks or small pockets of time. As challenging as being a twin mom can be, I’m glad I eventually decided to try for a second baby—especially since we got a bonus third as well. 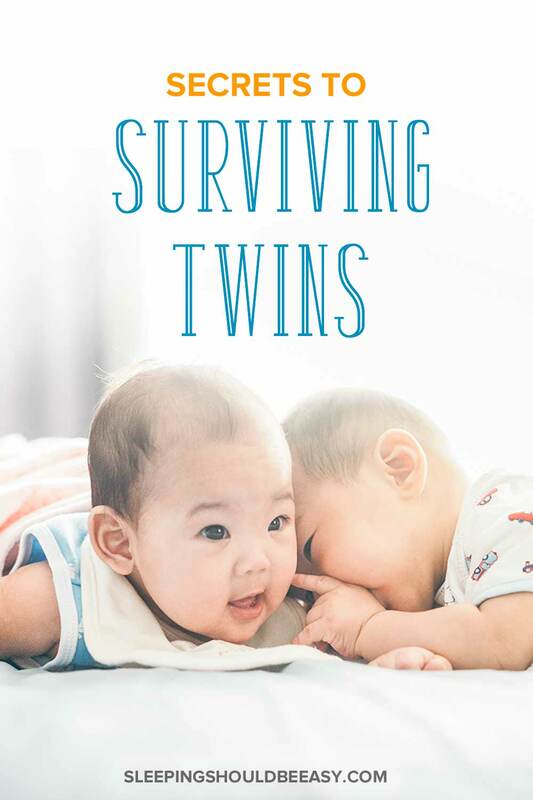 Tell me in the comments: what are you anticipating the most about surviving twins?